I’ve recently had the insightful pleasure of being able to watch over 10 slacklining beginners try their first highlines. From this, what have I seen, other than all of them navigating their internal freak-out? The first thing that comes to mind is that 95% of them didn’t walk the line. Most of them couldn’t even stand up. That was until two weeks ago, when I met James. He broke the spell that has seemed to have cursed so many highline first-timers. He set the standard for how to approach highlining, in my opinion. You want to learn to Highline? He should be your Role Model. By the end of this post, you will understand what James’ secrets to learning to highline really consist of…. James had all the boxes ticked for a highline beginner. When I first met him, I didn’t even know he slacklined – that’s how quiet he was. He asked few questions and mostly kept to himself. 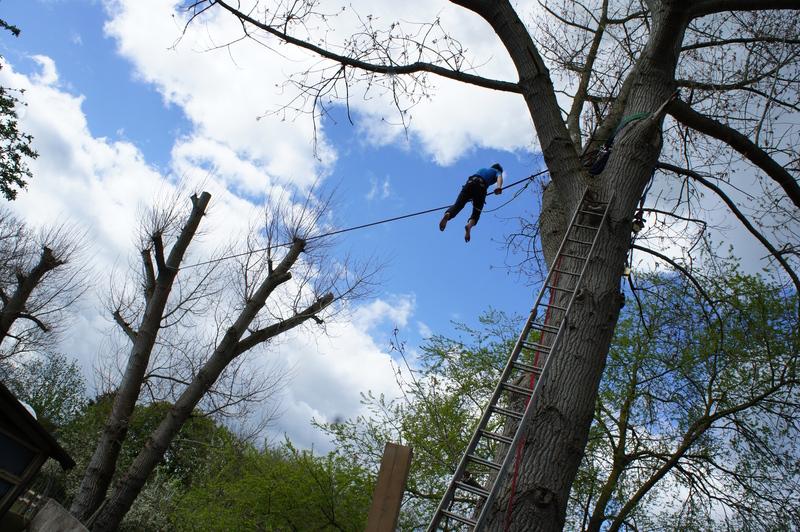 Until he spotted the training line we had rigged – a 10m high treeline, perfect for first-timers. He spotted the line was rigged, asking “Do you mind if I have a go?”. He climbed up and tied in. He sat there for maybe 30 seconds, max. He mounted, sent and destroyed. Onsite halfman. The most solid beginner send I have ever seen. “Now why is the above story so remarkable?” I hear you ask. Proactive – He found out about the treeline. He researched who his local slackliners were, including ones more experienced than him, contacted them, and asked if he could join in. Prepared – He knew how to tie in. He had already spent a little time in a harness. He was familiar with basic Leash Mechanics. He understood basic rigging principles and all about safety. Committed – He tied in and didn’t just sit there, thinking about the madness of the whole thing and trying to rationalise it. No, he got himself together quickly, without letting the doubtful thoughts creep in. Conviction – He mounted the line with conviction. His focus was the anchor point in the distance. He was getting to the other side, no matter what. Eye on the prize! Composed – But he was also composed. He did not let himself freak out. He was steady and got a solid send because he refused to PANIC! Now each of these points are a blog post in themselves, but I think it’s vital to aspire to nailing all of them before trying your first highline. Especially if you are going to send it. Proactive – James sourced out people who were better than him. If you want to know how to better yourself, surround yourself with people who are better than you at your desired skill. You’ll be surprised how much you learn when you let go of your ego. James also got himself to the location. It’s all good saying you want to highline, but are you really prepared to organise yourself, to put in the time to meet those slackers that are more experienced than you? How bad do you want to learn? 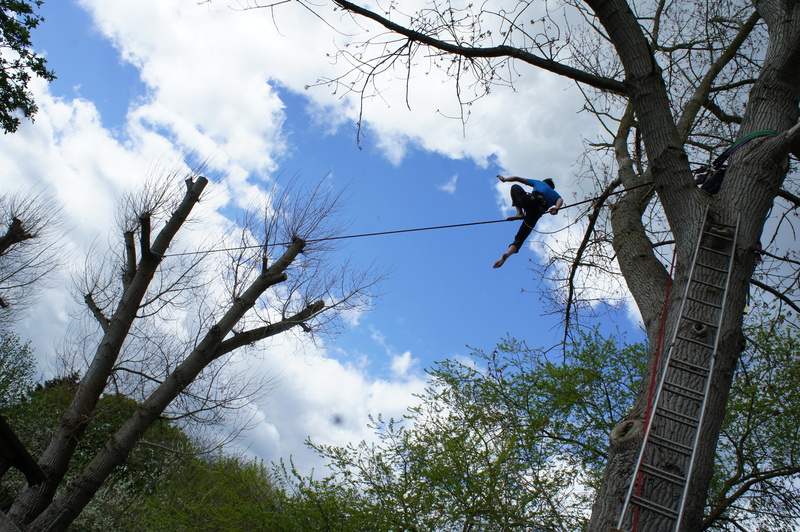 Highlining is completely different than just slacklining. It requires a massive knowledge set. If you aren’t prepared to learn the ins and outs, don’t waste everyone else’s time. A good place to start are the groups on Facebook: “UK Slackers” and “SlackChat”. There are tons of experienced slackers on there to pitch your questions to. Prepared – This is probably the most important point. James had two things completely dialed which contributed to his success; Mounting Technique and Leash Mechanics. This meant he was solid when he got up on to the line, and that he wasn’t freaking out at what that ‘little piece of rope that saves your life’ was doing in relation to his movement. To be comfortable with both of these things takes preparation and practice. It’s all good being able to mount a longline. But can you do it with control? Can you dismount with no hands? How much time have you spent thinking about Leash Mechanics? Because believe me, the highline will let you know if you haven’t done your homework! You should always start out highlining in the presence of people more experienced than you, in both fields of slacklining and rigging. Safety is paramount. Learn everything you can about the rigging before you even think about tying-in to a highline. My etiquette is you should only send the highline if you helped to rig it – at the very least, inspect it all first. Committed – Also known as ‘exercising your will‘. This is a tricky thing to practice if your unfamiliar with the process. A lot of commitment is founded on sticking to your decisions. You do that by not thinking about them once you’ve decided. If you procrastinate, the demons will creep in and will talk you out of doing it. Every second you sit on that highline ‘thinking’ about it, your setting yourself at a disadvantage. A good way to practice commitment is to walk longlines that are really difficult for you, perhaps at the peak end of your ability. Learning to fight on a longline should help you prepare for committing yourself to the highline. Commitment is a mental process, so practice it in everyday life, as well. Make a decision and stick to it. Conviction – How bad do you want it? You have to really want it. And there is a massive difference between wanting something, and liking the idea of wanting something. Highlining will show you instantly if you really want it badly or not. If you do want it, then act like it! Composed – “Steadiness of mind under stress” or as my friend Captain Clulow would say, “Keeping your s**t together!”. For me, one of the best ways to practice composure is through controlled breathing. You can practice this whilst longlining. Composure is again, all in the head, and is much easier to retain if you relax. In moments of peril, you better learn to compose yourself. It’s hard to mimic the effect height has on you, but you can practice controlled breathing to relax your mind and body. 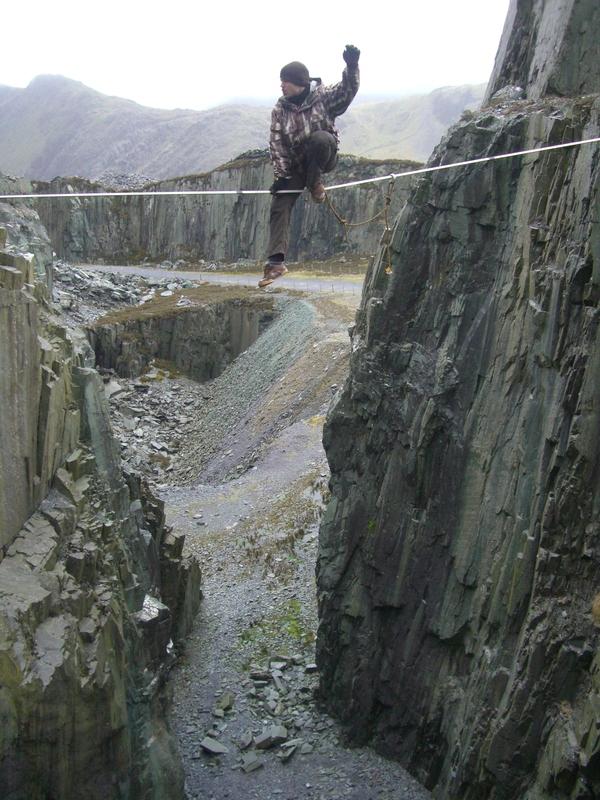 A good way to mimic the stress of highlines is waterlining, especially waterlining in winter where the incentive to not fall is exceptionally high. If you rig your waterlines high enough, it also serves as a great way to learn how to catch the line when falling. I’m sharing all this with you not only because of what I have seen and studied in beginners, but also because my first time on a highline was a bit of an epic fail. I traveled from Italy to Switzerland and blasted a load of cash, only to take one step on the highline. One step! Why? Because I didn’t have a solid mount. I didn’t understand Leash Mechanics, at all. And I didn’t have enough commitment, conviction or composure. Fortunately, I was surrounded by friends who were there to help, encourage, and teach me the ropes, but that still didn’t mean that I came home with a send under my belt. Master your levels of commitment, conviction and composure. Be as pro-active as you can to learn from those more experienced than you. You should aim to walk your first highline, first try, both ways. Discussion: How do you like to prepare for highlining? Any tips you have to share regarding commitment, conviction or composure? Disclaimer: Everything in this article is for entertainment purposes only. This entry was posted in Slacklining and tagged beginners' guide, harry cloudfoot, highlining, how to highline, james clulow, learn to slackline, Mich Kemeter, rigging, safety by harrycloudfoot. Bookmark the permalink.